This is one of those games which I played first on a mobile (such is the power of mobile casinos in 2014, I guess). It's weird, then, to review Tiki Wonders 'in reverse', as it were, seeing what the original is like, and how it most adheres to the developer's vision. There's Two Jackpots to be Won! At first glance, it's easy to see why NetEnt's slot made a seamless transition to mobiles and tablets. It's colourful, has some pretty basic symbols on its five reels, and the bonuses are totally no-nonsense. Best of all, though, is that this 5-reel, 30-payline online slot comes with two progressive jackpots - the Wonder and the Mega Wonder. So, for those reels. Cocktails are the order of the day here, with dolphins, chameleons, turtles, and toucans vying for space with various cocktails. The pina colada, mojito, and margaritas may not pay much, but they do look pretty appetizing. The surfing Hawaiian dude is the Wild, subbing for all regular symbols as he surfs on a gnarly wave. Five Wilds pays out a tasty jackpot of 10,000 coins so it can pay to hit this dude up. Hit the Hula Beauty (Not Literally!) to Earn up to 30 Free Spins! 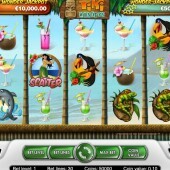 The Scatter, meanwhile, is the hula beauty, and as she shimmies her way across the sand she also activates a free spins bonus round when landing three or more anywhere on the reels. 10 spins are awarded straight away, with a 3x multiplier attached. However, you can win 20 spins by landing four Scatters, and 30 spins for hitting the maximum five Scatters when triggering the round. If you've played any of NetEnt's Progressive slots like the arctic-themed Icy Wonders (which is virtually a carbon copy of this slot) you'll know the drill: some symbols will contain a glowing star in the corner of the box. Hit four of these on the reels and you'll win the Wonder Jackpot; land five, however, and the Mega Wonder Jackpot will be winging its way to your bankroll. 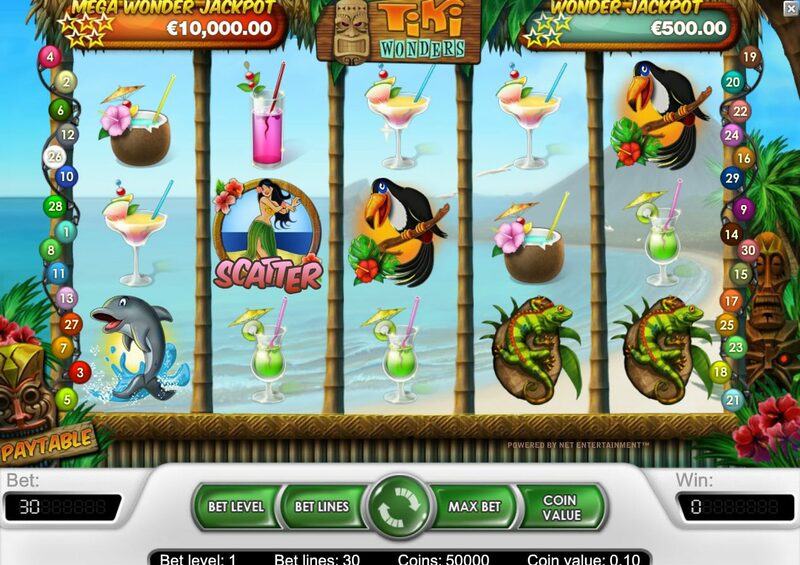 Tiki Wonders is a great little slot for fans of a quick spin. It won't win any prizes for looks, but it's fast and fun, and the free spins are a nice treat. Of course, if you can bag one of the progressives it's even better. And if other Tiki wonders are your thing, hunt out the enjoyable tropical island-themed Tiki Island from Gamesys or the great travel-themed slot from Play'n Go, Aztec Idols.